When I look at Cloud, the stay cat I feed, I see a mess of a cat, a pet, a domesticated animal. I have to remind myself that in reality he is as wild as the squirrel you manage to feed from your hand, or the raccoons that come into my yard. Cats are just not far from a wild state at any given time, and Cloud has definitely reverted to being a wild thing. But, I can’t help but see something that shouldn’t be wild when I look at him. So, when we saw that he had been in quite the fight and seemed to be a little under the weather, I decided to give him some antibiotics, I happened to have some that had been prescribed to Blackie that we hadn’t actually used. Now, of course, the second I decided to do this, Cloud began looking like he felt better. However, given his general state of nastiness, I decided a course of antibiotics might not be a bad idea and might prevent abscesses from forming after his fight. 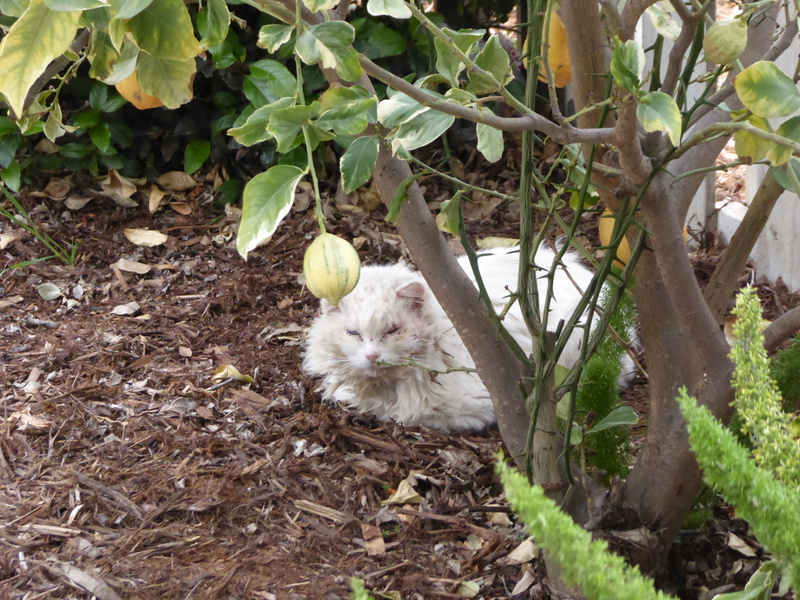 Now, Cloud is a street cat and as a street cat I am sure he has tasted some pretty putrid things like dead animals and gutter water. But, apparently, nothing like that compares to the taste of cat food mixed with antibiotics. Two licks and he just sat there for a while, licking his lips and trying to figure out what that weird and horrible taste was. Sigh. So I bought some tuna and mixed the antibiotic laced cat food with the tuna. Now that was apparently too good to pass up! I am now on day 2 of Operation Get Some Antibiotics into a Cat That Isn’t Even Mine. I know, you are shaking your head and saying to yourself, “He is yours now, Kim.” But, you need to understand, he isn’t any body’s cat right now. Cloud belongs to his own bad self. Maybe, with time, he might become a little bit ours, But he will have to decide that himself. Meanwhile, I just try to make his life a little better. Hopefully I am. 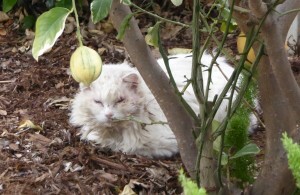 Long haired white cats that are mostly deaf are just not meant to be wild animals. He’s lucky to have you to provide some comfort for him! I love the name of this mission. Good luck, Captain. Aye aye! Day three went smoothly as well. He loves his tuna! Thank you! I am not a big tuna fan myself!!! He’s a scruffy but loveable cat! Well, I am not sure how lovable he is, as I bet if we got a hold of him we would lose some blood!But from afar we admire his ability to negotiate a treacherous wold with his bright white fur and lack of hearing. Cloud is one lucky wild thing to have found you!